I've been kicking around ideas for another forum-based board game, and I'm going to throw this one out there to see if anyone's interested. The game is Ticket to Ride. The board looks something like this. For those who have never played, the goal is to score points by connecting cities using the different colored train cars in your hand. The longer the route, the more points you score. Players are also given destination goals, which can give you a huge amount of points if you connect two specific cities on the map. There's a little more to it than that, but I'll go into more detail with the rules if enough people are interested. It's a pretty easy game to learn. The game is for 2-5 players; if I can get at least three people to commit to this, I'll start up a game. Also, let me know whether you'd prefer a Mario theme, a Zelda theme, or a Pokemon theme, because this is a video games forum. Any takers? Too complicated for me but I vote for a Pokemon theme because I'll probably lurk. Sure, I'd be willing to give this a try. I’m definitely in. I think a Pokemon theme would be cool and creative. In! I like all three themes. Also, the game's available on Steam so if anyone gets it let me know! I've got RU, ML and Kat in, with room for two more players. I also count two votes for Pokemon. Anyone else? What's the pace going to be? Well, the actions a player can take each turn are pretty limited (only one of the following: draw railway car cards, draw destination cards, or play railway cars on the board) and there isn't much information that needs to be updated besides the routes on the board once they've been completed, so I was thinking of having a set turn order, and letting players post their action as soon as their turn comes up without having to wait for me to post an update. (I imagine I'll be able to update pretty frequently anyway.) There would also be the usual 24 hour turn limit, meaning if a player's turn begins and a full day passes without them posting their action, the next player is free to skip the tardy player and post their own action. I'll go ahead and put in a vote for Pokemon-themed as well. I may start the game some time this weekend. Still got room for two more players, if anyone is interested. Alright, I'll be starting the game sometime tonight. There's still room for one person to join. In the meantime, here are the rules. Please give them a glance over, even if you're already familiar with the game. Here is the board, based on beautiful Kanto and Johto. 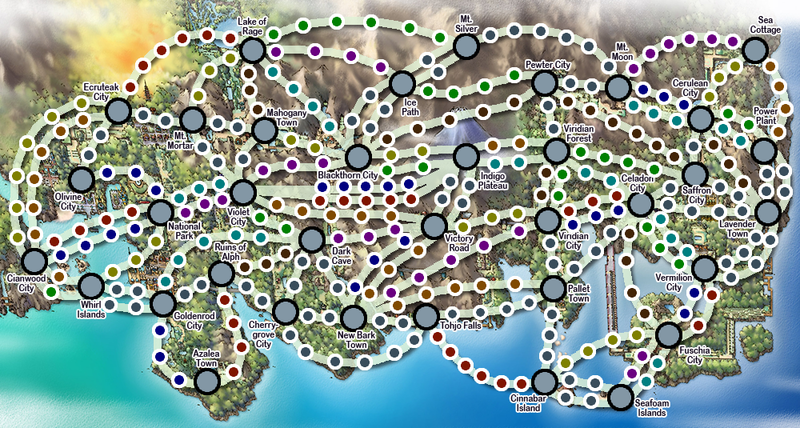 I referenced an actual TtR board when making this, and some adjustments had to be made to favor balance over faithfulness to the original in-game routes between cities. (If you're wondering why, for example, there is no direct route between Saffron City and Vermilion City, or between Violet City and the Ruins of Alph, just assume there's a sleeping Snorlax in the way.) I tried to make the map as decipherable as possible, but if you have any questions about it, just ask me. Completing the Longest Continuous Path of routes. Points are lost at the end of the game if you do not successfully complete the route given on the Destination Ticket(s) you kept. Each player will begin the game with four Train Car Cards, which will be sent via PM. Players will also be given three Destination Tickets, and must choose which ones to keep. A player must keep at least two, but may keep all three if they desire. You must respond to me via PM which Destination Tickets you want to keep before you take your turn. There will also be five randomly-chosen Train Car Cards drawn from the deck serving as Face-Up Cards (more on that below). I will post the turn order when the game begins. When it's your turn, simply post your action here in the thread. Your turn then concludes, and the next player's turn begins, and so on. I will update the thread and send PMs as often as I can, but there's no need to wait for me to update the thread before you take your turn, unless I haven't updated since your previous turn and you're still waiting on me to PM you Train Car Cards or Destination Tickets. There will be a 24 hour time limit to post your action once your turn begins. If you fail to take your turn within 24 hours of it beginning, the next player in line is free to post their action, thereby skipping your turn. If the 24 hour limit has passed but you manage to post your action before the next player in line can skip your turn, I'll allow your action. I will try to update as often as I can. Draw Train Car Cards – You may choose to draw two Train Car Cards either by selecting them from the Face-Up Cards, drawing blindly from the deck, or one of each. I will update your hand via PM. Any Face-Up Cards taken will be replaced with new randomly-chosen cards when I update. If you decide to take Face-Up Cards and I haven't been able to update in a while, make sure you're not trying to take any cards that have already been nabbed by a previous player. Claim a Route – You may claim a route on the board by stating the two cities you wish to connect, and the number and color of Train Car Cards you will be using. You immediately gain points upon completing a route. Draw Destination Tickets – I will PM you 3 randomly-chosen Destination Tickets. You must keep at least one of them, but you may keep two or all three if you choose. There are eight colors of cars (red, orange, yellow, green, cyan, blue, purple, and brown), plus rainbow, which is wild. Rainbow Train Car Cards are multi-colored and act as a wild card that can be part of any set of cards when claiming a route. If a rainbow card is one of the five Face Up Cards, a player who wishes to take it may take only it, and not a second card. If a player is lucky enough to get a rainbow from a blind draw, that player will still get the second card. You may have any number of cards in your hand at any given time. To claim a route, state the two cities you wish to connect, and the number and color of Train Car Cards you will be using. You must have the correct number and color of cards in your hand. The set of cards you use must be of the same color (apart from rainbow cards). Most routes require a specific color. For example, a blue route must be claimed using blue Train Car Cards. Some routes—those that are gray colored—can be claimed using a set of cards of any one color. When a route is claimed, I will update the board to show it. You may claim any open route on the board. You are never required to connect to any of your previously played routes. You may only claim a maximum of one route, hence connect two adjacent cities, never more, during a single turn. Some cities are connected by Double-Routes. One player cannot claim both routes to the same cities. The number of points you score for claiming a route depends on the length of the route. You can use your turn to draw more Destination Tickets. I will PM you 3 randomly-chosen Destination Tickets. You must keep at least one of the cards, but may also keep two or all three if you choose. Each player begins the game with 45 Train Cars. 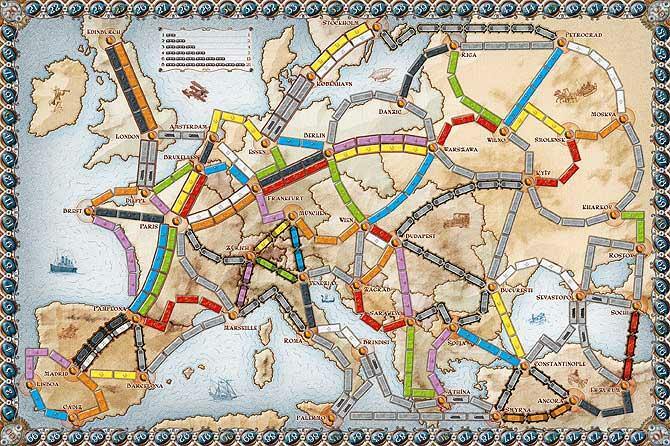 As a player claims routes on the board, their Train Cars get used up. When one player's stock of Train Cars gets down to 2 or less, each player, including that player, gets one final turn. The game then ends and the final scores are calculated. Players receive points throughout the game for claiming routes. At the game's end, points will be added based on Destination Tickets completed, and deducted for Destination Tickets that were not completed. The player with the Longest Continuous Route will receive an additional 10 points. When evaluating and comparing path lengths, only continuous lines of cars belonging to one player are taken into account. A continuous path may include loops, and pass through the same city several times, but a given car may never be used twice in the same continuous path. In the case of a tie for the longest path, all tied players score the 10 point bonus. That's about it. Please ask me if you have any questions or suggestions! All looks great, Val. Will we choose colors/avatars/trainers for our train cars? I was planning on doing colors, but what did you have in mind for avatars/trainers? I dunno if it’s viable at all, but I was thinking that we could pick Pokemon icons or little trainer sprites or whatever. It wouldn’t be trains, which sorta defeats the purpose, but idk, it was a thought. But colors work better, tbh, so you do what you want. That might work. Players, if you have a trainer or 'mon in mind, let me know, or I can just assign one when the game begins. If Piloswine makes a good icon, I’ll take him.